The engine: Tangled webs indeed; it's the RA420, a 1991 cc SOHC common rail diesel built by GM Korea Company under licence from VM Motori of Italy. This company was founded in 1947 as an independent concern, but fickle fortune over the years saw it sold and resold, completely and in half-shares, to a number of owners. It appears to belong equally to GM and Fiat Powertrain Technologies at present. Pedigree aside, it develops 110 kW/320 Nm in this particular application and in Chevrolet's Captiva, although it has appeared in a number of Opel, Hyundai and Kia vehicles too. It’s not the quietest machine, but at least you won’t forget it’s a diesel. Transmission is five-speed manual. The body: It's a four-door sedan, although the Aussies are working on a hatchback that might also come this way soon. The diesel engine is offered only in top-of-the-range LT trim with 17" alloy wheels, ABS brakes, power windows front and rear, power side mirrors, central locking, six airbags, RDS radio/CD sound system with auxiliary and USB inputs, leather covered steering wheel with satellite audio controls, leather seat covers, dual-zone climate control, rear park assist, rain sensing windscreen wipers, cruise control and auto lights-on function. The 328-dm3 boot is big enough for an average family's needs and interior space is plentiful. The spare is a full-sized steel item. The experience: The engine pulls quite strongly although it's not a rocket, getting up to the benchmark 100 km/h in a touch under ten seconds. With maximum torque developed at 2000 rpm and the rev limiter making itself felt at 4500, range is limited, necessitating a fair quantity of gearbox stirring. 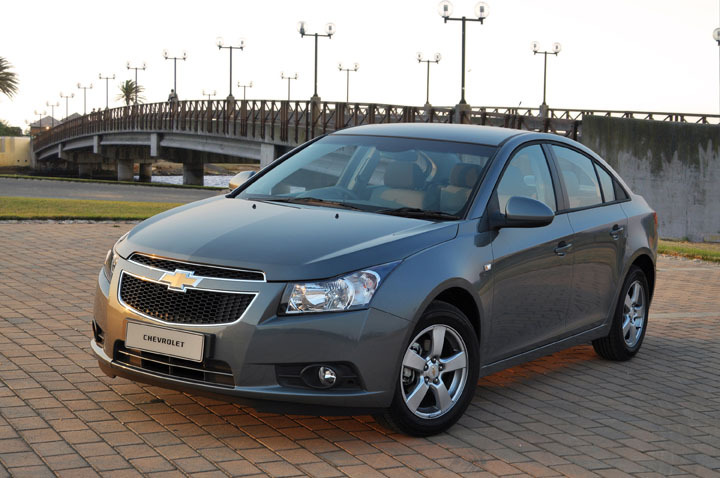 That said, it's the most satisfying Cruze from a driver's viewpoint, available up to now. Handling is up to par for family or fleet car use, meaning that most of us wouldn't have the courage to nudge its limits. The recent facelift has added PEPS or Passive Entry, Passive Start. That’s GM-speak for keyless entry and locking - you grab a door handle to open it and touch the silver square to relock - plus push-button starting. Other changes include a second makeup mirror, a deactivation switch for the front passenger airbag and a new radio/CD unit. It’s now a single-CD player with auxiliary and USB inputs while the radio has RDS capability. Not mentioned is the upholstery that looks far less plain than it did before.